When her father died, Cathleen Reis and her family were devastated — and frightened. The loss meant that her 4-year-old sister, Noreen, faced an especially fragile fate. Days after her birth in the early 1960s, Noreen had been diagnosed as “mongoloid,” a derisive term then used to describe a child with Down syndrome. Her prospects were dim. “After my sister was born, the doctor came to my parents and said, ‘Well, here’s some paperwork for Pennhurst,’” Reis recalled during a recent interview with CatholicPhilly.com. The Pennhurst State School and Hospital in Spring City, Chester County — to which thousands of individuals with intellectual and physical disabilities were committed — was notorious for its overcrowded and inhumane conditions. Patients were neglected, heavily medicated and often physically or sexually assaulted. A federal court ultimately ordered the facility’s closure in 1987. But the family struggled to provide the level of care Noreen required, and her father’s early death forced the family to seek outside help. That’s when they learned of the House of Divine Providence, a residential school in Delaware County for girls and young women with intellectual disabilities. Supervised by the Archdiocese of Philadelphia and staffed by the Daughters of St. Mary of Providence, the house represented a chance for Noreen to lead a full, productive life at a time when children with Down syndrome had few options. And 55 years later, Noreen continues to thrive in that same setting, now known as the Communities of Don Guanella and Divine Providence. 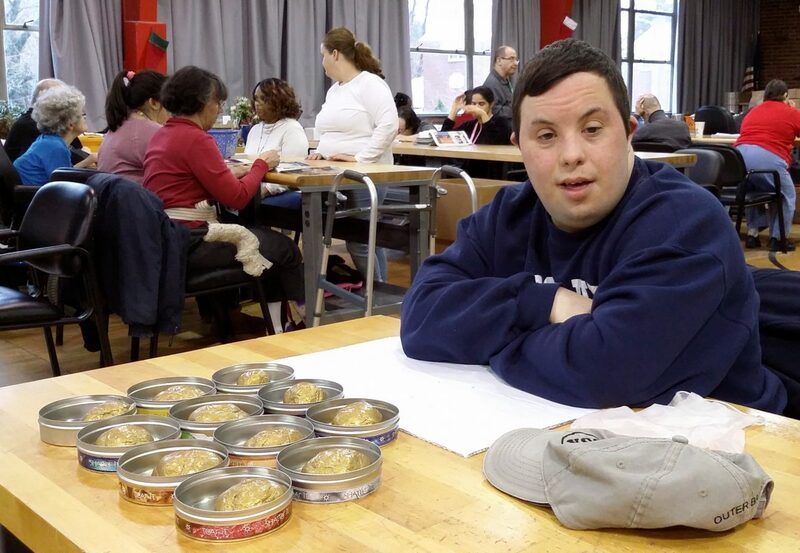 Administered by Catholic Social Services (CSS) of the Archdiocese of Philadelphia, the Communities of Don Guanella and Divine Providence offer a broad range of support to adults with intellectual and developmental disabilities. The communities combine facilities and programs such as on-campus residences, group homes, life-sharing arrangements, day programs, in-home support and family respite options. Round-the-clock nursing, psychological and social counseling, vocational and skills training, spiritual guidance and end-of-life care are all standard. More than 330 adults live on site with 250 participating in the day programs, including 62 non-residents, making the organization among the largest providers of its kind in Pennsylvania — and one of the most diverse in its services. “We can care for individuals who need minimal supervision and are reasonably healthy, all the way to individuals who are aging with their disabilities and suffering cognitive decline — with dementia or other neurological issues — and becoming medically fragile,” said Mark Bradford, the senior director of philanthropy for Don Guanella and Divine Providence. Most of those served by the communities are age 21 and over. However, the organization’s commitment to its clients often begins much earlier. Many individuals transition into the communities from St. Edmond’s Home for Children, a CSS residence in Rosemont that serves medically fragile youth with profound intellectual and physical disabilities. “We’re proud of the continuum that we have, and we have modified our programs to be able to really support the individuals that come in from St. Edmond’s,” said Barbara Jenkins, director of admissions and communications for Don Guanella and Divine Providence. Jenkins walks families through the process of registering with their county’s intellectual disabilities office, which provides the referrals needed to secure admission and benefits. An interdisciplinary team reviews the applications to ensure a fit between the client’s needs and the communities’ resources. As one might expect, clients’ satisfaction with the level of care they are receiving is a key to success, but so is the longevity of the staff. While the federal government projects that demand for caregivers will increase 40 percent by 2026, salaries remain low, averaging just over $11 per hour in Pennsylvania. Staff turnover in this field is generally high and can significantly diminish the quality of care provided to the client. In contrast, the Don Guanella and Divine Providence communities have experienced “a lower than average turnover rate,” according to Jenkins. She credits Catholic Social Services’ commitment to employee recognition and advancement, as well as consistent efforts to increase staff pay and benefits. Helen Rizzuto is in her second decade of employment at the communities. Rizzuto is a floor supervisor at the communities’ work activity center, which offers vocational experience in partnership with local businesses. 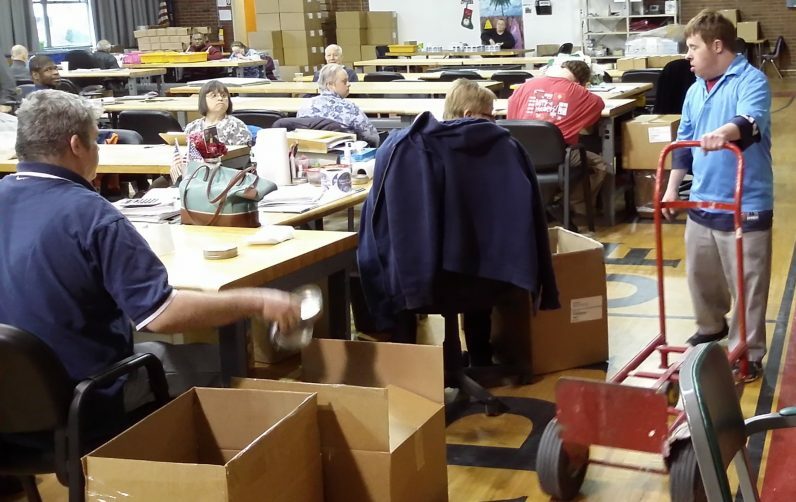 Participants process orders at a piece rate that is tailored to individual abilities. 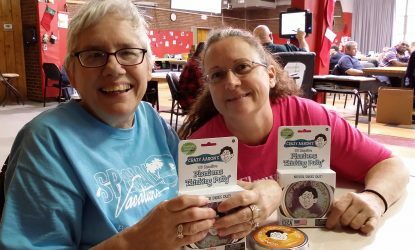 Aaron Muderick, the president and founder of Crazy Aaron’s Thinking Putty in Phoenixville, has relied on the work activity center since 2010 to fulfill client orders. Participants in the center meticulously measure, fill and pack tins of Muderick’s craft putty, and the tasks are among the most popular on the production schedule. “The putty is definitely my favorite job,” said Vinay, who attends the work activity center five days a week. Muderick regards the partnership as a “tremendous asset” in his business. Paul Holmes, the administrator of the center’s day programs, agrees that the communities inspire all involved. I would like to know more about what other companies enable the center to provide work for these dedicated individuals. It is wonderful that the daily work tasks give these young men and women a sense of worth and accomplishment. You also can’t fake their enthusiasm at, for those at Secane, 10 AM Holy Day Mass. Their active responding is what anyone’s should be. I love that we care for those in need but there are those who do not get care and need it too. my daughter was diagnosed with depression when she was 12 yrs old. she is now 33 and still suffers.